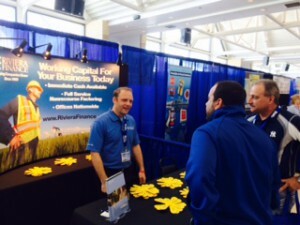 Riviera Finance was excited to attend the Ohio Valley Gas Oil Expo on April 28 & 29, in St. Clairsville, Ohio. It was a well attended event. Here Jason Smith is discussing Riviera Finance factoring program with a couple of attendees. Jason offers “What was realized from Riviera Finance attending the trade show is that there is a growing demand for contractor services by the energy companies as they increase production. While this is good news for the industry, many contractors are having a tough time with cash flow to run their business when waiting for payment from the energy producers”.